You'll be £4.99 closer to your next £10.00 credit when you purchase The Pocket Guide to Sheds. What's this? What is a shed? Someone you know might say 'A shed? It's a shed. That's one, over there'. And who has a shed? Well, old Cyril's got one, where he makes his aeroplanes, and Wendy on the allotments, she's got one. True enough, but is that all there is to it? No. There's mystery here, and infinite variety, and the story goes back for a thousand years. Or more, probably. If there are a million reasons for having a shed, but not one solid argument against, why doesn't everybody have one? Is there something peculiar going on? The answers, my friend, are in this book. Here, you can find the man who reinvigorates the entente cordiale in wood, the woman who boils kettles outside the pub, the woman who says 'I'm Nicola from In the Shed', the man who says 'What's yours? ', the dooket that Jock built, the blockhouse that Noah built, a neoclassical stately home, and all manner of things musical, yogic, animalcular, roguish, postal, humorous, ockerish and cloudy. Whether we see our shed as a place of work, a place of fun, a welcome refuge from normality, a shaded pool of tranquility, a realisation of a secret yearning, a place to pot up the geraniums, or a little bit of all of those, we Sheddies, tribesfolk of the mighty Sheddici, hold one truth to be undeniable. We have our sheds, and the others have not. 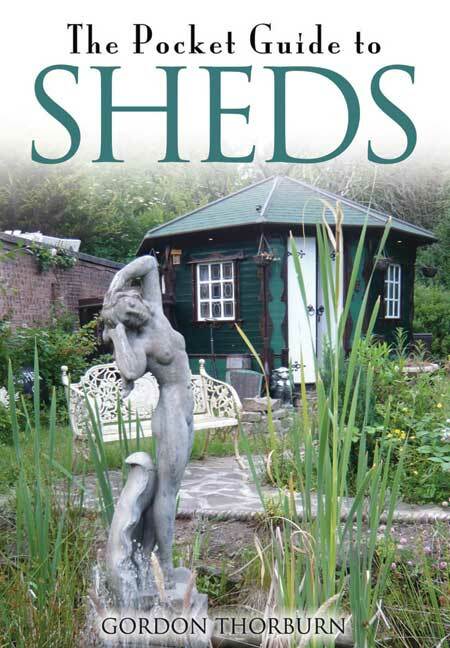 In this fun little book, the author explores the history of sheds and the culture surrounding them. He explains that for sheds to appear, a highly developed civilization must be in place. Sheds have been used through the ages as storage areas and animal shelters. A culture of Sheddists traces their roots from the dawn of civilization. Today, they retire to their sheds as places of creativity or solitude. As gardeners, most of us have sheds where we store rakes, shovels and other tools, but many of us also incorporate sheds into the theme of our gardens. We proudly display our sheds and use them for any number of activities. From seed starting, to building containers for our plants, our sheds are a vital part of our gardening experience. The author takes us on a delightful tour of British sheds and their owners. We see everything from artist studios to creative little backyard pubs. Sheds are undoubtedly the original ‘man cave', havens from cell phones, computers and television, or... a comfortable place for friends to gather to watch the ball game. Shed furnishings tend to be casual and reflect the individualism of the Sheddist who decorated it. Sheds house their collections, and in some instances, are the collection. Many Sheddists find they cannot stop with one shed. Creative carpenters build sheds out of everything from rescued boats, to signal boxes for steam locomotives. Proud British Sheddists show off their individuality and their sheds are singular examples of human creativity. They anticipate the need for more storage space well in advance of actual things to store. The number of items needing storage, generally expands along with the shed. The author quotes Pickford's Law, which states: "The amount of stuff expands to fit the space available." It seems that some things are the same, no matter what part of the world you hail from. The author admonishes would-be garden Sheddists to make their shed twice as big as they think it should be, to accomodate things that you can't throw away, such as "pieces of copper tubing, celing roses,broken sprayer parts, bags of fertilizer granules that have solidified into concrete,oyster shells,ancient runner bean seeds in a tobacco tin and the pretty glass marble that you found" It sounds like he's had a peek into my shed! Gardeners are Sheddists at heart and it should be fun to see sheds from around the world. In honor of this creative little book, show us your sheds! You won't need too much help to decipher this writing. The stories and examples will amuse and inspire despite being written in a semi-mystical style. Don't be put off by this, it is this style that has earned Gordon Thorburn his position of high priest of this cult. The writing has reportedly inspired several other sub-sects such as National Shed Week (an annual event) and Shedworking (a daily inspirational script) and indeed the author of this site. There are no measurements, no specifications. There is however a big source of inspiration and investigation into just what it means if you are about to take that first step towards realising a long held ambition to build a shed. If someone you know and love needs that push to commit (or be committed) to a shed building project. Or you need to understand why they are not alone, but part of a larger consciousness with a long history, then this book is for you. I am told that quite a few of our sheddies get a mention and you may even see my ugly mug in their if it’s got past editorial proofing or what ever these book people do, it’s out on the 16 Jun 2011, just in time for Shed Week which starts on the 4th July. And the shed featured on the front cover of the books is non other than sheddie – John Manning and Dot’s Dooket, it’s called that as it was built for Dot Cotton from Eastenders! As the globe warms, everything runs out and people become the willing slaves of small electronic machines, we have our response: the Golden Age of Sheds. We can look out from our sheds and see those unfortunates, the slaves in question, the ones who would rather be stripped naked and whipped through the market square than be separated, for one nanosecond, from their portable telephones and i-thingies, and we can smile. This book is where the smilers are. Here, you can find the man who reinvigorates the entente cordiale in wood, the woman who boils kettles, the woman who says ‘I’m Nicola from In the Shed’, the man who says ‘What’s yours?’, the dooket that Jock built, the blockhouse that Noah built, a neoclassical stately home, and all manner of things musical, yogic, animalcular, roguish, ockerish and cloudy. Whether we see our shed as a place of work, a place of fun, a welcome refuge from normality, a shaded pool of tranquility, a realisation of a secret yearning, a place to pot up the geraniums, or a little bit of all those things combined, we Sheddies, tribesfolk of the mighty Sheddici, hold one truth to be undeniable. We have our sheds, and the others haven’t.